OSHKOSH, WIS. (October 9, 2017) – Oshkosh Airport Products, LLC, an Oshkosh Corporation (NYSE: OSK) company, will celebrate Oshkosh Corporation’s 100 Year Anniversary at inter airport Europe, Stand C90, on October 10-13 at the Munich Trade Fair in Munich, Germany. The company will showcase and demonstrate a number of new technologies now available to airport customers around the world, including a Striker® Simulator virtual reality training system. Inter airport Europe visitors will have the opportunity to “test drive” the Oshkosh Striker Simulator virtual reality training system, responding to simulated emergency situations in a virtual reality cab environment. 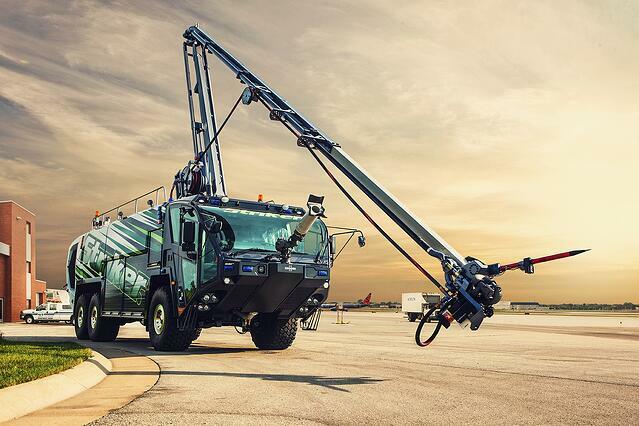 The system features actual cockpit components from the Oshkosh Striker vehicle, and includes a complete 180-degree view ahead as well as an overhead video monitor showing the Snozzle® high reach extendable turret in action. The Striker virtual reality training system depicts different environmental and weather conditions such as rain, snow, fog, night, and bright daylight as well as the delivery of dry chemical, foam, water, and even Halon. Other componentry on display includes Oshkosh’s innovative EcoEFP™ foam percentage test system. EcoEFP’s patent pending electronic foam proportioning system allows ARFF crews to test the foam percentages without discharging any agent from the vehicle. The K-Factor™ system display is a new alignment tool that utilizes a sensor on the Snozzle piercing tip and a video monitor inside the cab to display a target for the operator. Finally, the Oshkosh interactive RunwayReady™ telematics system display shows remote diagnostics and vehicle readiness capabilities. This unique system enables maintenance teams to remotely check vehicle fault codes, and to receive maintenance reminders and alerts, as well as other data from a smart phone or similar device. These innovative technologies and systems are available on the entire range of Oshkosh Striker vehicles, including the new Oshkosh Striker 8 x 8 apparatus with its matching pair of Scania rear-mounted, Tier 4F low-emission engines that deliver up to 1540 horsepower driving all eight wheels. Photo caption: Oshkosh Airport Products will celebrate Oshkosh Corporation’s 100th anniversary at inter airport Europe, Stand C90, where it will showcase and demonstrate a number of new technologies now available to airport customers around the world, including a Striker® Simulator virtual reality training system.